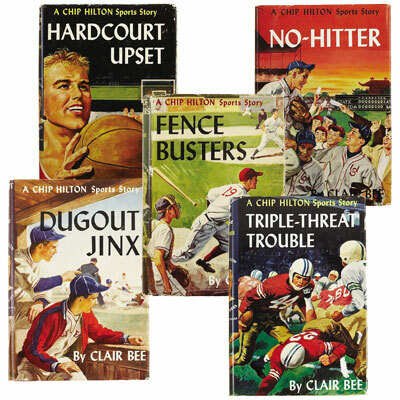 Five Chip Hilton classics – Dugout Jinx, Fence Busters, Hardcourt Upset, No-Hitter, and Triple-Threat Trouble - Clair Bee 1952 - Grosset & Dunlap, New York - First Editions	Five first editions from the inspirational Chip HIlton sports story series, written by the successful college basketball coach and 1968 Basketball Hall of Fame inductee Clair Bee. Dugout Jinx – During the last week of that hectic baseball season, it was Chip from his position on the dugout bench who was able to solve the baffling puzzle of what had happened to the team’s pitchers and its general morale. Fence Busters – There is a lot of wonderful baseball in this Chip Hilton story, and a lot of good sportsmanship and clean manhood besides. These friends of Chip’s have what it takes to pull a demoralized and strife-torn team out of the dumps and get it back at busting fences again. Hardcourt Upset – When Chip Hilton, sensational scoring sophomore, is benched by a knee injury, and the basketballchampions are beaten by Tech, their home-town rivals, things take a turn for the worse. No-Hitter – After helping State University win the N.C.A.A. baseball championship through his superb pitching, Chip Hilton had looked forward to a pleasant summer at home in Valley Falls. But when State was selected to represent the United States i a college baseball series with two of Japan’s finest teams, Chip, like his teammates, was thrilled by the opportunity. Triple-Threat Trouble – Chip Hilton, All-America quarterback and captain of State University’s team faces one of the most challenging situations he has ever encountered on the gridiron. William "Chip" Hilton is the central character in this series of twenty four inspirational and highly successful sports novels for adolescent boys written by the successful college basketball coach and 1968 Basketball Hall of Fame inductee Clair Bee (1896–1983). In addition to Bee's authorship of the Chip Hilton series, he was also the author of several basketball and coaching technique books. The Chip Hilton series was published between 1948 and 1965 by Grosset & Dunlap, with Bee's last manuscript, Fiery Fullback, published in 2002. The series hero excels in football, basketball and baseball, and is often placed in the position of persuading his less-than-perfect teammates to play his way and share his values—with winning championships being the result. Stories have two or three subplots, sometimes unrelated to sports, and one title is distinguished for tackling racism. The Chip Hilton books sold 2.2 million copies, and, in 1997, the NCAA founded the Chip Hilton Player of the Year Award.